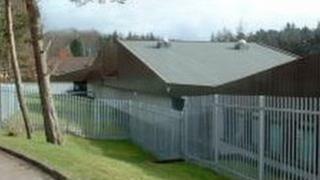 A school in North Lanarkshire has been closed because of a suspected chlorine gas leak around the swimming pool. Fire crews were called to Fir Park Secondary School, Fir Park Street, Motherwell at about 08:00 after the janitor identified a problem. Two men were given precautionary check-ups but no one was injured. Pupils arriving were sent home and staff were sent to nearby schools. An exclusion zone is in place while fire crews deal with the incident. The school is expected to re-open on Friday. A spokesman for North Lanarkshire Council said: "At around 8am this morning the janitor at Fir Park school discovered an elevated meter reading of chlorine in the swimming pool area. "He immediately notified the fire service who arrived quickly and isolated the pool area. The school building was closed to pupils and staff. "Two men were given precautionary check-ups in line with standard procedures for such incidents. "No pupils were in the school at the time and none were exposed to the chlorine. Pupils have returned home, while staff have been sent to nearby schools. "Scottish Fire and Rescue Service and Police Scotland remain on the scene. We will contact parents later today to update them on the situation." A spokesman for the fire service said: "Two appliances were immediately sent from Motherwell and Hamilton along with the specialist environmental protection unit from Hamilton. "Firefighters reached the incident less than eight minutes later and the leak was quickly isolated. "Crews worked alongside an advisor from Glasgow Science Services to conduct atmospheric monitoring and this confirmed a zero reading within the building." The spokesman added: "The incident has since been scaled down and a single crew will remain in attendance until an engineer has completed an assessment of poolside equipment and deemed it safe."